Some kind words from some of our customers in Lancaster County. We love getting to know our customers and we believe that customer feedback is one of our most valuable resources. Please take a minute to read our many wonderful customer reviews below! IRL has been doing my pond clean-up and maintenance for more than 10 years. They are always professional and do an excellent job. When they are done, my pond looks great! Sandy R. , Leola, Pa. Customer focused and easy to work with. They met all of my expectations from design, plant selection to trimming and pruning! Good communication and prompt service. 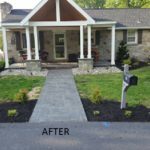 We are more than pleased with the work done by Indian Run Landscaping! The crew was very professional and kept me informed on everything that was going on. I would highly recommend them to anyone! We are very pleased with the work that Indian Run Landscaping does for us! Their crew was so courteous and they know how to do their work. From start to finish, top quality job! Calls were returned, time lines were clear, they were open to my preferences and incorporated them into my design…they brought plenty of guys and our big job was done in one day. We just love the work and have already requested an estimate for another job! Jason, Ian and crew were great! Fun to work with and very professional! The finished results are amazing! Thank you for giving our home a new look! Jason developed a wonderful plan, paid close attention to our suggestions, and reviewed it thoroughly with us. He even went over it in the actual space as a final confirmation. Ian and the staff were excellent, hard working, careful and courteous. Each staff member here represented your company very well. It was a pleasure to have them working at our home. We are very pleased with the final result! It would be our pleasure to recommend your firm to anyone looking for new additional landscaping. Clyde and Nancy W., Lancaster, Pa.
Jason was instrumental in developing options and recommending adjustments in this project design. 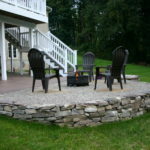 The completed stone patio came out beautifully and superbly constructed as a result. Will be looking to have landscaping work done in 2018. Throughout the years they have transformed our yard into something to be proud of. Beautiful walls, patio, walkways and flowerbeds.They are skilled at what they do, very kind, and I would highly recommend them. The work that was done is beautiful and we love it! We also appreciate the way Jason handled the job from beginning to end. From first call to the shop (Tammy) to the installation everyone Randy (owner), Jason, Ian and the crew were more than professional and friendly. Tammy took care of business. Jason listen to what I wanted, and I was very pleased when I saw his design. Ian and the crew were prompt, hard working, and friendly. I would recommend them to anyone. We’ll be moving in 3-5 years, and I will use them again. We are very delighted with the work that was completed by Indian Run Landscaping! The crew worked very hard on a difficult job. My wife and I can now enjoy sitting in our yard again! We had a lot of work that needed to be done to our backyard, more than we could handle on our own! The Indian Run Landscaping team came to the rescue! Thank you for the amazing renovation! A huge weight has been lifted off my shoulders, and I can enjoy being outside again! We are very happy with the work that was done by your crew! They were very nice and worked very hard! There was great communication from the beginning, and Jason was very knowledgeable in what needed to be done. Thank you Indian Run Landscaping! Eugene & Barbara, Lancaster, Pa. Your team did a great job fixing the pavers around our pool. We will be calling for more work in the Spring! Really nice job!! Enjoyed working with Jason. Very knowledgeable and helpful. Friendly crew on install day. They worked over ten hours on a 90+ degree day! Will recommend your company to friends! Bill & Sandra S., Landisville, Pa. The crew was professional and effective. I am very glad I called your company! To enhance the front and side of our house, we decided to level off a sloping garden area. We contacted Randy at Indian Run Landscaping, and he came out to measure and explain our options. A stone wall in a color that complimented our house was decided on. It was installed in a timely manner, and looked better than we could have imagined! Our neighbors stopped by to tell us how great it looked. We enjoyed the friendly service and plan on having them do more work for us. Kathy and John E., Ephrata, Pa. Your crew did a great job on the clean-up, edging and mulching of our yard! We had a great experience with Indian run landscaping. This company is the perfect combination of old school face to face sales mixed with the convenience of modern day technology. I was able to schedule my initial consultation with their landscaping designer right on their website and was also able to pay my final bill online. Being a mother of 3 (and one child being a newborn) this was huge for me. Jason came up with a beautiful design for our home, always went over things in person with me, and was conveniently reachable quickly by email as well. Their install team worked hard on my property for a full day in the rain to make sure they got the job done quickly. We have gotten endless compliments on our property over the past few weeks and are thrilled with the results of their hard work. 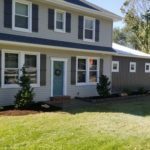 Thank you so much Indian Run Landscaping for transforming the outside of our home! Anne A. , Lancaster, Pa.
Jason & the crew did a great job! The front beds look amazing! Everyone was polite and respectful of our property. I just wanted you both to know how much I love our new landscaping! I have been using Indian Run for the last four years since my husband passed away. As a single mom with a full time professional job, I didn’t feel that I had the extra time to work in my yard. It was such a joy to come home every Friday to have my lawn freshly mowed and a relief to know that someone who knew what they were doing had a handle on taking care of my landscaping. The online payments are very easy and the fees are reasonable. Thanks for such great service! You are so good at listening to our ideas and visions, and making them come to life-The skill level was amazing. Cobblestone edging job looks very nice! We are pleased as always! The Spring clean-up and mulch job looks great! Ian, Laura and Jason were great to work with. They were also great listeners. Ian and Mike did a great job and they were very patient with me! Our yard was a difficult one to work with, and now our yard looks very nice! Our project was completed to our expectations and in a timely manner. Ian and Jason were both friendly and accommodating. 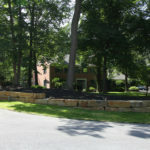 Indian Run Landscaping has created a natural stone retaining wall for one of our gardens and a beautiful flagstone patio. My wife and I enjoy them both. The workers were very courtesy. Over the years, we have also used Randy and his team for lawn care, mulching, and shrub trimming. Very professional and a great price! 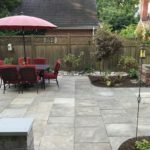 The patio looks great and we are extremely pleased with your work and would be willing to provide testimony as such to any of your future clients. 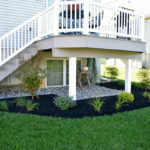 Indian Run Landscaping was very courteous and professional in meeting our landscaping needs and did an excellent job. We also particularly appreciated their willingness to work with us by adjusting and altering their original design and quote to accommodate our budget. Randy and his staff at Indian Run Landscaping have continued to go above and beyond in every way. When my husband and I purchased our new home 4 years ago we had a 15’x15′ koi pond in our backyard and had no idea how to take care of it or maintain it. We found Randy and he immediately took us under his wing and showed us the ropes. When we had a frog stuck in the pump or pump issues he was always there within an hour to service our needs. When we decided to make the pond into a pondless waterfall Randy was patient with us as we continued to change our minds and he never stopped offering direction. The pondless waterfall is now an amazing feature in our backyard and the work from start to finish was done superbly. Randy and his crew have also edged and regarded our front yard making a big difference in the moisture we were seeing on our basement wall. I would never call upon anyone else for any of my landscaping needs. The waterscape that Indian Run Landscaping designed for my property rivals any that are pictured in waterscape literature or on web sites. Its waterfalls, pools, plants, and rocks are now home to fish, frogs, and from time to time, other wildlife. My water garden is truly beautiful and a marvelous addition to my home. I highly recommend Indian Run to anyone who wants competent, personalized, and professional landscaping service. 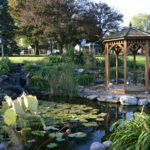 Randy and the Indian Run Landscaping team have done our landscaping and Koi pond since we built our home in 2004. His work has always been top quality and professional. Rick and Debbie S., Millersville, Pa. I have been extremely satisfied with all the work that Indian Run Landscaping has done – from installing retaining walls to planting trees. I especially love the new paver patio and walk; it has greatly improved the appearance of our home. I will not hesitate to contact them for any future landscaping needs. I contacted approximately a half dozen pond builders, I asked many questions about how they would go about installing my pond. Pricing and a warranty were also very important. I chose Indian Run Landscaping because of their competitive price, their warranty was two years (everyone else was only year) and their personal touch. I felt like I had known Randy for years. Howard D., New Holland, Pa. I cannot say enough for the quality of work you and your team have performed over the years on our property. The landscaping was creative and exactly what we wanted. The courteous and respectful attitude on the part of all your employees has been much appreciated. I would hire recommend your firm to anyone looking for old-fashioned values, especially honesty and integrity. The Griffin Family, Conestoga, Pa.
Indian Run Landscaping has been providing me with landscape and maintenance services for over five years. In every instance they have been most helpful — giving good advice, presenting good and interesting ideas, and always working with the client to maintain the budget. I have the highest regard for Randy Hunt and his employees. Thanks to you and your crew for another job well done! Tim W , Mountville, Pa.
Everyone was very professional and courteous. I think the project turned out great! Loved the way I was kept informed of every part of the project!